Born from a time of conflict, but now serving as vital links between island communities, the Churchill Barriers are remarkable structures that have become as iconic as many of Orkney’s more ancient landmarks. It was the sinking – by German submarine attack - of HMS Royal Oak in October 1939 with the loss of 833 lives, that prompted then First Lord of the Admiralty, Winston Churchill, to order the building of a series of causeways – the Churchill Barriers – to block off the eastern approaches to the naval anchorage of Scapa Flow. Work on the barriers began in May 1940, being completed four years later. Much of the labour for this massive engineering project was provided by Italian prisoners of war, held in a camp on the island of Lamb Holm. Those prisoners unwittingly created their own modern-day tourist attraction with the remarkable transformation of a basic Nissen hut into a beautiful symbol of peace – the world-famous Italian Chapel. 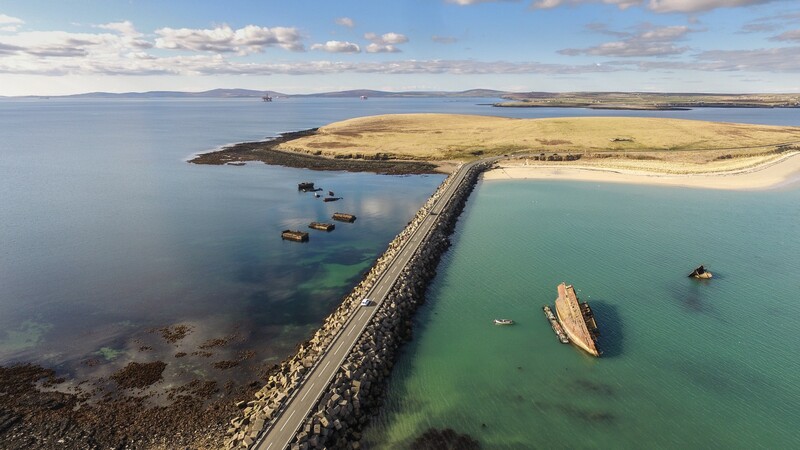 Officially opened in May 1945, the barriers now act as causeways linking the Orkney mainland with the isles of Lamb Holm, Glimps Holm, Burray and South Ronaldsay.